Hello, this is Rusty, and I’m so delighted to be introducing this special cyber-birthday-greeting to the most beloved employee Marie and I have ever had the privilege to work with—Amy Williams. Last year, we celebrated Amy’s 21st birthday by treating her and another employee, who also turned 21 at the same time, to a special night out at a local steakhouse (Oh my, how time flies). We have very fond memories of that occasion and we feel so blessed to still have Amy with us. This year, we’re back to our traditional way of honoring an employee’s birthday, by serving up a specially decorated and extremely sweet cake, and floating a few balloons around. In addition, we thought this would be a great opportunity to tell Amy how much she means to us in the form of this posting on our website. Now, all visitors to our site will know how cherished Amy is around here, and what a valuable asset she is to our company’s mission. Besides all of the attributes shared by Maya and Marie below, I believe that two of Amy’s most enduring qualities are her loyalty and her spirit of gratitude. She’s been there for Marie and me from her first day on the job more than two years ago, right up to the present. We’ve had other girls come and go, some making decent contributions, some being nothing but drains on our time and energy. Amy stands on a plane above them all. She doesn’t just do what she’s told; she does what needs to be done. And, she’s always gone out of her way to assist us during our most demanding projects and our most trying times. How refreshing it is as an employer to have a staffer who arrives early and leaves late, and who’s always concerned that every detail has been attended to. And, if for some reason, Amy doesn’t fulfill a certain obligation, she’s quick to apologize, and ready to compensate with an even greater effort next time. How could you not love and appreciate her? Then, there’s her sense of thankfulness; lacking in so many kids her age (and all age groups, for that matter). While Marie and I have always tried to lavish generous perks on our employees, we have done so knowing that our reward is more often in our giving, and not in our receiving thanks. Yet, Amy is cut from a different piece of cloth, and she has always gushed with gratitude over even the slightest favors we’ve bestowed upon her. Marie and I were practically speechless when we received several of the first “Thank You” notes from Amy after giving her gifts or granting her perks. She doesn’t do it because she’s told to: she does it because her heart is genuinely filled with warm, friendly feelings of gratefulness. UNR, the school Amy attends, would be wise to have her teach a course on giving thanks, which should be required before diplomas are awarded. 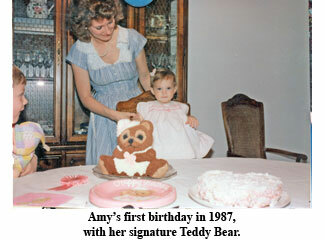 But now, it’s our turn to thank Amy, and to congratulate her on turning the Big Two Two. In the younger generation’s vernacular, Woo Hoo Hoo! I think it’s certainly safe to say that without this girl at the store, we would surely be a wreck. As an example, Amy handles many clients for her bosses, Rusty and Marie Goe; she’s in charge of making sure that the other girls are on task; and she assumes countless responsibilities that go above and beyond her stated duties. If it has to do with our national club, the C4OA, or the POS cash register system, or just dispensing general knowledge on how to do what needs to be done, Amy is always the “go to” girl. With all that being said, I think it’s time we mention the main purpose for my portion of this weblog: February 11th is little Amy’s 22nd birthday, and the third one that she’s celebrated with the crew at Southgate Coins!!! For her birthday, which because of schedule conflicts, we celebrated on Saturday, the ninth, we wanted to surprise her and write a little something for the whole world to see; something she totally didn’t expect (And, as with any surprise here at the store, there was a lot of scheming involved so that she didn’t suspect a thing). We’ve been working tirelessly this week to ensure that this weblog got posted without any notice from this weekend’s VIP, and I think it’s been quite a success. Since the spring semester began, Amy and I have now been working on separate days, and it gets very difficult sometimes to communicate day-to-day activities with one another. Because of this, we are in constant correspondence through notes we leave each other. Every day I come in, I’m told by the Goes that Amy and I act like sisters when it comes to handling our duties at the store, and I’m sure Amy gets similar reports. One thing the Goes don’t mention is how much I appreciate Amy being responsible for me and my duties, and that she herself is one of the biggest bonuses I get for being a Southgate employee. Sure, Free-Lunch-Fridays and flexible hours are great, but there is something special about being able to honestly say that I enjoy working with the people around me: Amy in particular. I hope that at 22 years of age, little Amy knows that aside from her family and friends outside of work, there are definitely three people that would go to the ends of the earth for her—right here at our own little coin shop. As Maya mentioned, it has been tricky for the crew here to plan a weblog for Amy this week. And as Maya said, it takes some scheming to pull off surprises. Just two weeks ago, for instance, Rusty had a heck of a time getting a special poster delivered in honor of Amy’s two-year anniversary at Southgate, without her knowing about it, since she’s the one that usually handles such projects. I must admit we ended up telling some white lies on that adventure, and we were prepared to do the same for this birthday surprise too. Amy’s 22nd birthday allows us to let her know what she means to us. You’d think just working with such a beautiful, intelligent girl, with a great personality and a sense of humor would be more than you could ask for. But Amy means so much more to us. We wanted her to know a few of the reasons that cause us to love her so much. Amy shows all of us support and friendship, which is genuine and dependable. I can’t say how much of a comfort it is to know there’s a person who is not only on our side, but is connected and involved in all of the challenges, problems, and victories we experience. What happens to us happens to her; and the folks that matter to us, matter to her. We feel so blessed to have this thoughtful, caring girl with us. Her loyalty fosters trust and allows us all to be our best. Each day she is with us is a true joy. From your friends and “family” at Southgate Coins.